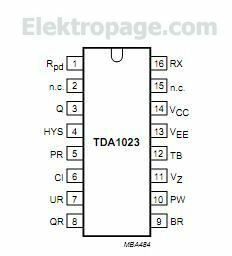 The TDA1023 is a bipolar integrated circuit for controlling triacs in a proportional time or burst firing mode. Permitting precise temperature control of heating equipment it is especially suited to the control of panel heaters. It generates positive-going trigger pulses but complies with regulations regarding mains waveform distortion and RF interference.